A good meditation bench, chair, and cushion always help in enhancing the quality of your meditation. It could be a great help if you want to take your meditation session for an extended period of time. 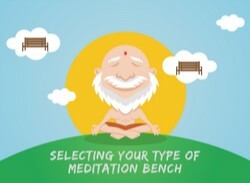 This guide will help you in choosing the best meditation bench, chair and cushion according to your meditation pose and physical limitation to meditate. As a meditator, your ultimate goal should be to reach the highest state of consciousness. But it is not an easy as it seems, there are many hurdles on this path and most of the time it is our physical limitation that becomes the obstacle on our path to self-realization. It is extremely important to sit in a correct meditation posture. Posture in meditation has a direct impact on channelizing vital energies in your body. Patanjali, one of the great meditators to walk on our planet, had put great emphasis on the quality of posture. He uses the term asana siddhi, perfection of posture. By perfecting a posture means to reach a state where you can sit unmoving in one posture for as long as you want without experiencing pain or numbness in your body. Correct posture is about the perfect stillness of the body. Stillness of the body fuels stillness of the mind and in turn, it helps you be more still physically. They complement each other. 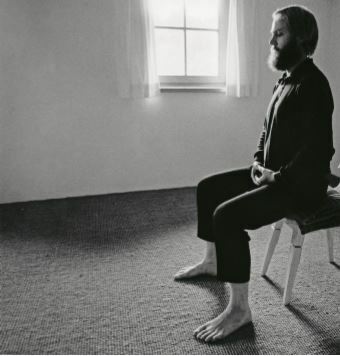 However, this does not mean you have to sit still for several hours and bear the tremendous pain( It could be your back, knees or any other part of the body), but whenever you do sit down to meditate, it could be just fifteen minutes, make a point to sit like a rock. This allows the energies in your body to be still. Calmness will start to envelop you automatically. The act of meditation will become more joyous and the rewards will come quicker. Patanjali said that one can sit in any posture that is comfortable and one that brings stillness in your body. This does not mean you can completely ignore the basics of posture. Cross-legged – if seated on the floor or on a bench. 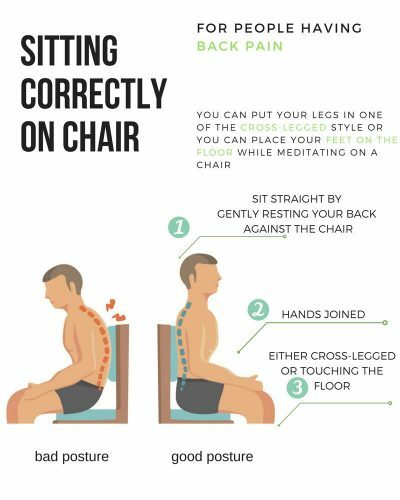 If your physical condition does not allow you to sit in a cross-legged position then you can sit in a chair with your feet flat on the floor. You can do all types of meditation practices sitting on the floor, but what if you have some specific medical condition…? 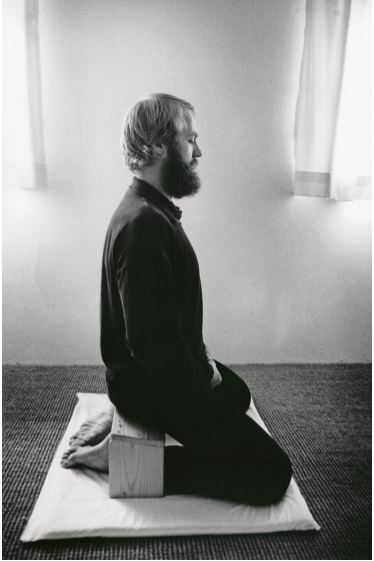 in any case, if you can’t sit on the floor to meditate, the next best thing you could do is get a meditation bench or a chair or a cushion and meditate. 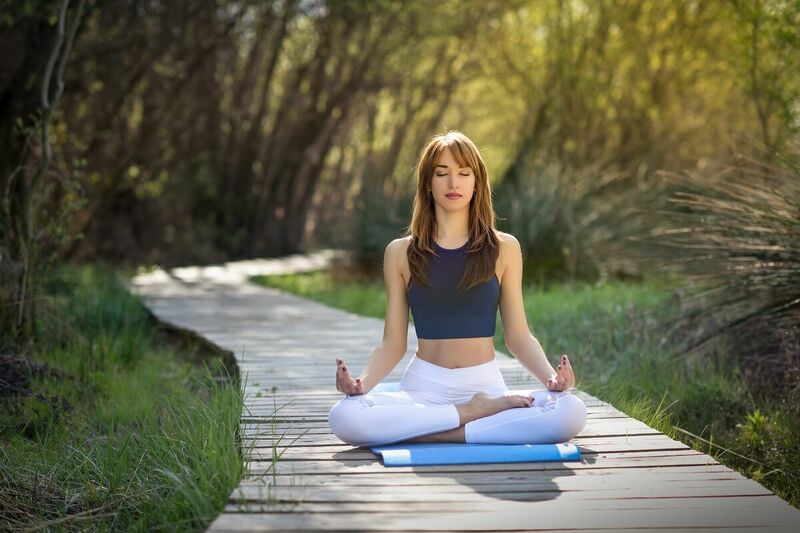 If using a meditation bench or chair or a cushion helps you in perfecting the posture; if it helps you to meditate for a longer period of time, then you should definitely use it. It could be extremely useful for people who have bad knees. People having age-related issues such as arthritis, lower back pain can use a chair to comfortably sit for a longer period of time. A Meditation cushion is always recommended for people who meditate on the floor especially those who meditate in a cross-legged and burmese pose(sukhasana) as it provides the meditaor with a great comfort and in turn, you will be able to meditate for a longer duration. Remember – Our goal is to sit comfortably for a longer period of time without having any difficulties. I am not going to confuse you by recommending tons of benches or chairs. I will try to be as specific as I can and will only recommend the product that is going to solve your problem. There are many ways of sitting cross-legged. You can choose any way that you are comfortable with. 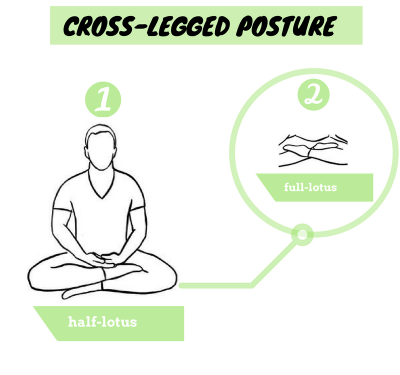 Sitting cross-legged is important because it helps you control the descending energy. There is one other popular posture known as Burmese, or sukhasana(Easy Pose), where one lays his feet comfortably on the floor. If you can’t sit on with full-lotus or half-lotus pose, then you can try this pose. It’s easy and as effective as full-lotus. Don’t forget to join your hands and rest it on your lap though. Sitting on the floor with cross-legged and burmese pose can be difficult especially for beginners as it can numb your feet and as a result, you won’t be able to meditate for long. So, a cushion and a pillow set can bring great comfort to your meditation session and in turn, you will be able to concentrate more without worrying much. A zafu and zabuton meditation cushion set are used by a meditator who meditates on the floor and in any of the cross-legged or Burmese posture. 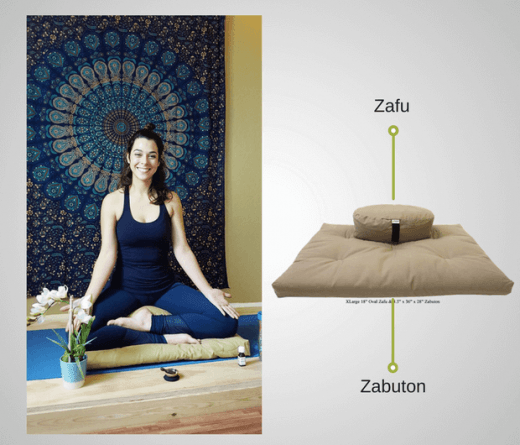 Zabutons are used underneath a meditation cushion, zafu or a bench. With this set, you can meditate for a longer period of time before needing to shift position. If you meditate on Burmese pose – sit on the zafu and it props up your hips and lowers your knees which in turn aligns your spine straight. If you meditate on cross-legged pose – then you can either sit on the zafu or zabuton according to your comfort. 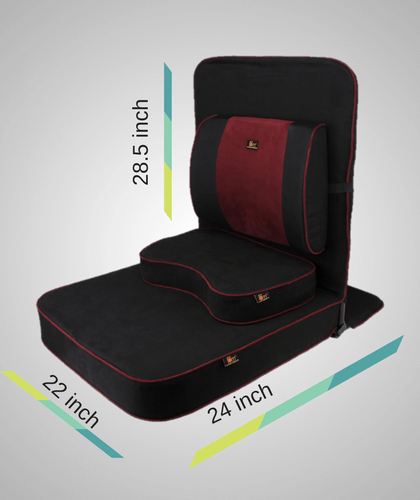 These sets provide you the best ergonomics for better spine alignment and help you keep your legs and feets from falling asleep making your meditation session the most comfortable. Size – standard and x-large. Standard comes with round zafu and X-large comes with oval zafu. If you get confused about which size to buy, then get the x-large one – as it fits perfectly for most of the people. If you are into zen meditation, then you might be familiar with this pose – This is often known as seiza kneeling posture. If you meditate on seiza kneeling posture then a seiza meditation bench is an absolute necessity. Since seiza-style involves resting your buttocks on the heels while folding legs underneath the thighs; you will feel intense pain in the ankle, heel, and muscle of your sole will get pulled. Excellent ergonomics, stable while in use, durable and padding provides great comfort. It has foldable legs so that you can easily carry with you, It easily slips into a backpack, a suitcase or a meditation bag. It comes with both angled legs and rounded legs. 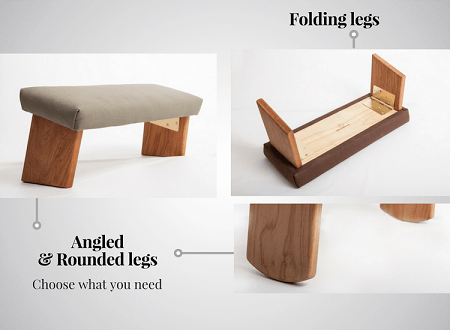 You can choose what you need while buying; however, angled legs provide greater support to your back. It has enough space underneath it allowing people with bad knees to adjust their feet according to their own comfort. It comes in two size – Tall and Standard – If you’re in the 5’10” to 6′ range or taller, then go for the tall bench. If you are not sure which size to buy, then you can even order an extra set of bench legs. Upholstery – Comes in cotton and silk. Cotton upholstery is more durable and silk gives the bench a softer feel. It is hard for you to get into any of the cross-legged and seiza kneeling postures with aching knees. In that case, the next best thing you could do is get a chair and sit comfortably with spine straight, hands joined and feets touching the floor. The height from the floor to the seat should not be too high or too short; if it’s too high then your legs might not touch the floor and if it is too short then your knees will bend upwards and practicing meditation on such posture is totally wrong. All the elements of a good posture that are mentioned at the beginning. See how his thighs are positioned in parallel to the floor, hands joined and back straight. No need to buy any fancy staff. A normal chair will work just fine. If you don’t have any then i have a recommendation for you too. To adjust your position according to your height you may place a cushion or pillow under your feet – just to maintain the perfect posture. This chair below will work fine if you don’t have such. You’ve got all the motivation, dedication and will that one needs to meditate, but you don’t have that back. An aching back could completely demotivate you from sitting in any of the meditation postures for a longer duration. Some even give up doing meditation. 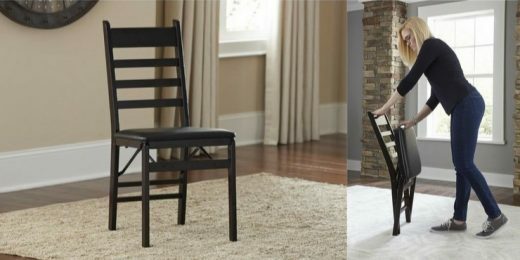 Now, if you have got that lower back pain and you cannot sit straight, then look for a chair or a seat with a straight back support. Idea is to give a little support to your back, you are not ought to bend your back and lean against the chair. Your back should always remain straight under any circumstances, no matter which type of meditation posture you are on. This portable meditation chair is simply the best for people having back pain. You can meditate on any posture you want. Spacious and it has a meditation block which is great for people who cannot sit cross-legged. Water-resistant, fully foldable and a transport bag is included also. Its comfortable padding helps you in avoiding leg numbness and in turn, you can meditate for a longer period of time on it. You can’t sit on the floor – cause you’ve got bad knees! Nor You can sit straight – cause you’ve got that damn back! Sit on a chair with a back and maintain the elements of a good posture that I have mentioned at the beginning. Here’s a chair that will fit your need. Your posture should be firm but not tense. It should be steady and comfortable. You should neither be stiff as a robot nor pliable as a plastic doll. Don’t forget to smile gently while you meditate; there’s enough sadness in the world. With a comfortable posture and natural stillness, it becomes much easier to build the concentration required for great meditation.